Live out your cast away dreams on these remote and mostly unexplored islands. Home to numerous white sand beaches, turquoise inlets, giant palm trees and the famous coco de mer coconuts. Lying 1000 miles off the coast of East Africa, the 115 islands of the Seychelles archipelago are some of the most beautiful on the planet. The 41 inner islands are the oldest granite islands on earth, while the 74 low lying reef islands are the definition of paradise with lush tropical forests and exotic wildlife. Spend the night anchoring in Baie Ste Anne, the UNESCO protected valley with enchanting paths winding through enormous palms and the famous coco de mer coconuts. Say hello to the giant Aldabra tortoises in the protected island and bioreserve Curieuse. Stroll through mangrove forests and go snorkelling in magnificent underwater scenery. Visit the palm-thatched roofs and white sand beaches of La Digue, the most beautiful island of Seychelles. 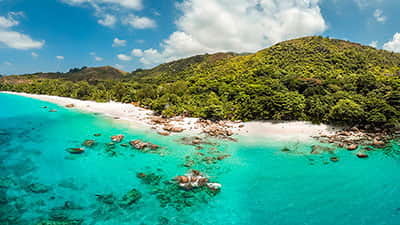 Almost unchanged since the earliest settlers, La Digue is a world away from the hustle and bustle of the main islands. Walk through the vanilla scented plantations at Union Estat or check out the rare birds in the nature sanctuary on Cousin island. 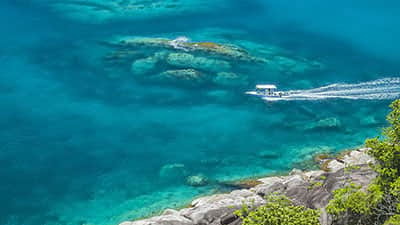 Stunning landscapes, relaxed island hopping and plenty of chances for a swim in exotic reefs make Seychelles a dream yacht charter destination. Temperatures are warm year-round, with the best time to visit is in April and May, or October and November when the water is warm. The wettest months are December to February.